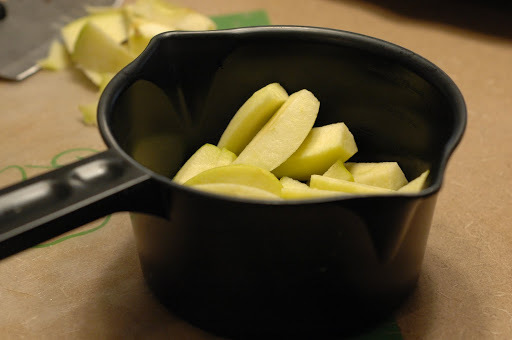 Making baby food is easy and saves a LOT of money. For example, the first time I was making baby food back in November I went to Whole Foods and bought $18 worth of produce. That $18 worth of produce made 168 cubes of food (more on that below). Two cubes is equal to a jar of Stage 1 food, so that means I made 84 servings of food for $18. I went to Target and calculated that each jar of organic baby food cost .64 cents after tax. At Target, $18 would have gotten me only 27 servings, but instead I got 84!!! That’s a lot of math, but the point is you can really save by making your own baby food. Plus, now that she is older (turned eight months a couple days ago) I can make my own combinations by mixing a cube of this and a cube of that. First, wash your food. Take a moment to gaze upon your beautiful organic fruit knowing that all those pesticides aren’t going in your precious child’s body… (ok, sorry-I’m a really big proponent of organic fruits and veggies, but if you don’t buy all of them organic at least consider buying the Dirty Dozen organic-more on that here). Next, peel, core and chop. If your child is older like mine is now, you can leave the peels on. But for first-time eaters, I would peel everything. And here’s my favorite gadget. 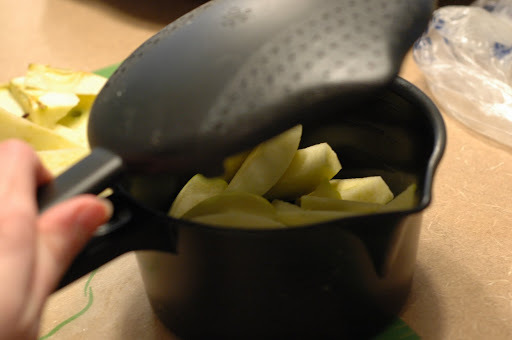 This is a micro-cooker from Pampered Chef. I think it cost me $8, and it is AWESOME! It is BPA free (don’t worry-I called Pampered Chef to verify 🙂 and you just put your food in it, add a little water, put the lid on and microwave. I usually do about 3 minutes. It perfectly steams your food in minutes! You can use it for all sorts of stuff, but I really like it for baby food. This is what the lid looks like. 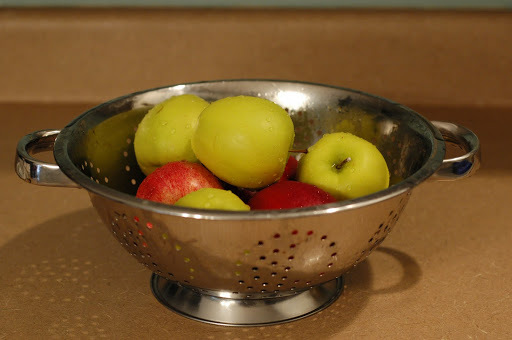 It’s even got holes so you can pour off the excess water easily. How cool is that contraption? (I promise I do not work for Pampered Chef. I just happen to think this invention is the bomb dot com.) ((Isn’t that a fun expression? the bomb dot com? yeah, I thought so too when I saw it on my friend’s hilarious blog)) (((Do you like how I just keep adding in parenthesis as I digress further and further?))) I’m done now. I promise. Now, let the blending begin. 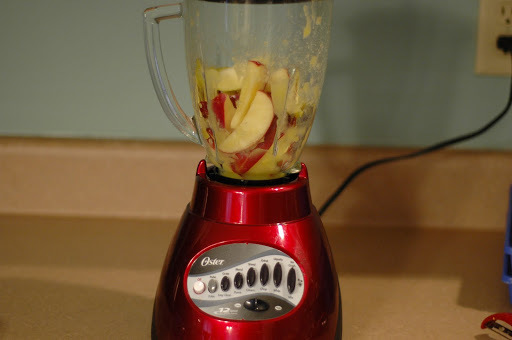 Just throw your cooked veggies or fruit in the blender and start going. Add water as needed to get it to the consistency your child needs. 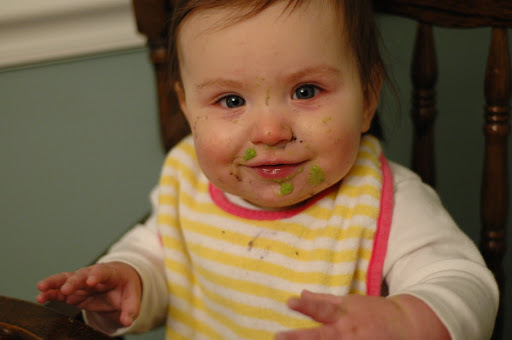 For younger babies, make it perfectly smooth and a little runny. For older babies, you can make it a little chunkier. 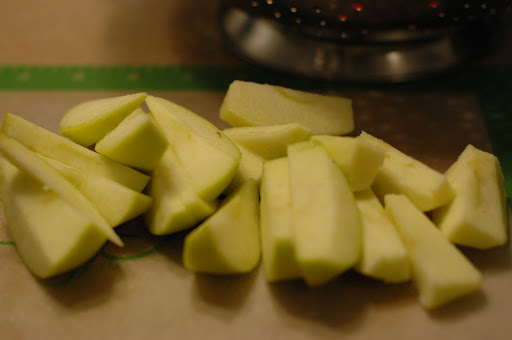 Once it is blended to the right consistency, spoon it into ice cube trays. 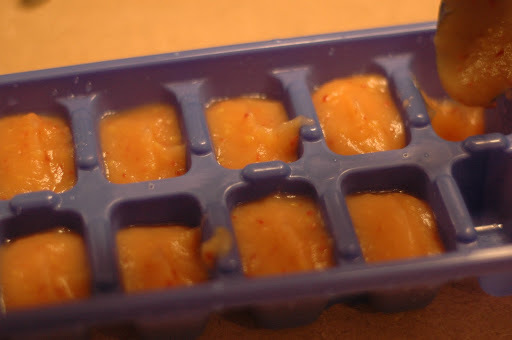 Put the ice cube trays in the freezer overnight. Take them out the next day, and put them in Ziploc bags labeled with the food name and date made. When it’s time for baby to eat, take out the cubes you need and microwave them to the desired temperature. Then, feed baby! So far, I’ve made pears, apples, peaches, blueberries (L’s fave! ), carrots, sweet potatoes, peas (another of L’s faves), green beans and butternut squash (which we like to say squatternut bash because of a Friends episode… anyone else seen that one?). Give it a try! And for a little non-frozen food, I love to mix half of an avocado with half of a banana in the blender for a little lunch-time protein. The girl loves it! Haha, I love this post 😉 I'm so stinking grateful for Emily's pampered chef-ness … you got the baby food gadget of the year and I can now peel my avocadoes in 2 seconds FLAT. Ok, I have that Pampered Chef thing and haven't really used it much. (My mom got it for me.) I obviously do not have kids to make baby food for, but I will definitely try it for steaming stuff! Also, love that "Friends" episode. I was obsessed with that show. I can quote most any episode! Also, I miss you!